Soak up the atmosphere at Hardys Bay Club, the central coast's best-kept secret. 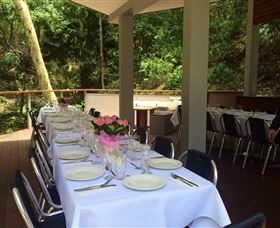 Backing onto natural bushland and a stone's throw from the bay, the club has a large outdoor area with kids' cubby and pergola backing onto a natural waterfall. Proudly poker machine and TAB free, the club boasts great live entertainment, quality restaurant food and a bar stocked with craft beers. The club's Bistro is headed by chefs with a background in fine dining, and they pride themselves on their quality, local ingredients: from Hardys Bay oysters, to house-baked breads and fresh fish. Situated on the shores of Hardy's bay, Yum Yum Eatery has some of the central coasts most spectacular views.Head Chef David Featherston is passionate about sourcing only the very best and freshest produce available.At Yum Yum Eatery we believe that fine food and wine should not cost the earth and we aspire to make this style of food accessible to more people. Our service is always approachable, welcoming and attentive.